He had made a profession of faith in Christ, was a member of the Little Barren Separate Baptist Church, and was a lifelong farmer. Mr. Slinker was a WWII Veteran having served in the United States Army as a Medical Technician with the 609th Medical Clearing Company. He served overseas for 21 months in England, France, Belgium, Holland and Germany. He was the son of the late Donald Claude Slinker & Audrey Clark Slinker. He was the patriarch of a remarkable family; his wife of 75 years, Dora Vaughn Slinker, survives. He leaves 33 direct living descendants. Mr. Copley Clark Slinker, 94, of Greensburg, KY, departed this life on Wednesday, March 14, 2018 at the Taylor Regional Hospital, Campbellsville, KY. He was 94 years, and 6 months of age. The funeral services for Mr. Copley Clark Slinker will be conducted at 10amCT, Saturday, March 17, 2018 at the Cowherd and Parrott Funeral Home, 206 S Main Street, Greensburg, KY, with burial to follow in the Little Barren Cemetery with full military honors conducted by the Marion County Veteran's Honor Guard. Visitation was requested from 4pm until 8pmCT, Friday, March 16, 2018, at the Cowherd and Parrott Funeral Home and after 7amCT, Saturday until time of the funeral service. 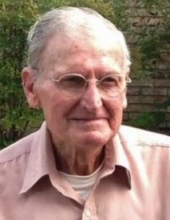 Mr. Copley Clark Slinker, son of the late Donald Claude Slinker & Audrey Clark Slinker, was born on Friday, September 14, 1923 in Green County, KY, and departed this life on Wednesday, March 14, 2018 in Campbellsville, Taylor County, KY. He was 94 years, and six months of age. He had made a profession of faith in Christ, was a member of the Little Barren Separate Baptist Church, and was a lifelong farmer. Mr. Slinker was a WWII Veteran having served in the United States Army as a Medical Technician with the 609th Medical Clearing Company. He served overseas for 21 months in England, France, Belgium, Holland and Germany. He is survived by his wife of 75 years, Dora Vaughn Slinker of Greensburg, KY, having united in marriage on November 4, 1942. Mr. Slinker was also preceded in death by a son: Gary Clark Slinker on September 5, 2002; a sister and two brothers: Laverne Curry, Herman Slinker and Marvin Slinker. Memorials are suggested to the Little Barren Cemetery Fund, which can be made at the funeral home. The Cowherd and Parrott Funeral Home, 206 S Main Street, Greensburg, KY, is in charge of arrangements. 2018-03-17 - 206 S Main Street, Greensburg, KY - Photo from Cowherd & Parrott Funeral Home.